Documents reviewed by The Wall Street Journal show that thousands of complaints about suspicious online pharmacies and other websites in 2012 weren’t reviewed for months because ICANN stopped maintaining one of its computer systems. “I don’t know how contractually we could do something different than we are doing,” says Akram Atallah, president of ICANN’s Global Domains Division... Mr. Atallah says employees are “doing a very good job.” ICANN’s overall budget is $101 million for the current fiscal year. Former Federal Trade Commission Chairman Jon Leibowitz says ICANN needs continued oversight, partly because of its small compliance staff. Just 22 of the agency’s 300 employees are devoted to policing websites. An independent ICANN could be “dangerous for stakeholders, and more importantly, consumers,” says Mr. Leibowitz. Here's one truism ICANN has yet to grasp: good governance is hard, but necessary. The Internet's days as a free-wheeling, unregulated marketplace are soon coming to an end. What the end result will look like is yet unknown, but the world re-discovered in 2008 that markets are not self-regulating, and there is a need, and place, for good, effective governance. This applies to the Internet as in all other sectors of public life. Of course, ICANN, a California corporation with no membership nor stockholders, and only a self-interested, self-selected Board of Directors which apparently owes a fiduciary duty only to the corporation itself, not employees nor stakeholders, is anxious to gain independence from all government oversight, without taking on any of the burdens (and costs) inherent in exercising such global authority and responsibilities. Whatever the outcomes of the IANA transition and ICANN enhancing accountability processes, if effective and responsible governance of the DNS and internet root zone, on a global level, from criminal activity is not included (to take just one example), it will not be long before governments throughout the world do whatever is necessary to wrest control of the DNS and internet, globally, or within their respective borders, in order to protect their own populations and public interest from ICANN's "hands-off, just pay me the money" approach to internet governance. For a view of what real governance within the sphere that ICANN operates, looks like, see this search of US Federal Trade Commission actions. ICANN's source of authority, shield of immunity, and excuse not to govern, has heretofore been its contractual privity with the US government. Once that is gone, from what sovereign source of authority does ICANN have any legitimate claim to exercise authority over the global internet community, domain name registrants, registrars, registries, the DNS, and the internet root zone? No one has really given a good answer to that yet, but it will be a fertile area for litigation worldwide and other international disputes if left unanswered. And apparently, neither ICANN's President of Global Domains Division (see quote above of Akram Attalah) nor anyone else at ICANN has a clue as to how ICANN, contractually, could do anything differently than it has been doing (or not doing). Perhaps, at a minimum, Mr. Atallah should consult with competent counsel who have FTC, or similar governance and regulatory experience, much of which is based solely on contractual terms. On the other hand, if you are that clueless, perhaps you are unfit for internet governance. shared and made stronger by all. And we need you to make it better. Empower all people to use and contribute to the Web, including support for diverse languages and accessibility. W3C20 Anniversary Symposium: "The Future of the Web"
Interviews with W3C (World Wide Web Consortium) staff and consortium members at the Third W3C Web and Television Workshop, September 2011, Hollywood, CA. The IANA Stewardship Transition Coordination Group (ICG) held its sixth conference call on Wednesday, 29 October 2014 from 12:00-13:00 UTC. Secretariat candidates' identities were not disclosed, but there are two final candidates. Decision to be finalized on or before November 15, 2014. Additional discussion concerned future calls and meetings (dates/times) and the uncertainty about the ICANN meeting in Marrakech. The ICG has handed off substantive IANA transition work to "three communities" (names, numbers, protocols) it maintains are the ones affected by the IANA Stewardship Transition via RFPs (Requests for Proposals) with a tight timeline in order to submit its final proposal to the ICANN Board of Directors for transmission to the US Department of Commerce's NTIA well before the "final deadline" of September, 2015. Work has started in the "three communities"--e.g., IETF's (protocol parameters) latest draft is at: http://www.ietf.org/id/draft-ietf-ianaplan-icg-response-02.txt--but according to ICG member Keith Drazek (via chat window during the ICG call): "I would also point out that the Naming community is struggling with the January [15, 2015] target date for delivery, so scheduling should take that into account." More information about the ICG and the IANA Stewardship Transition: NTIA IANA Functions Stewardship Transition Microsite. 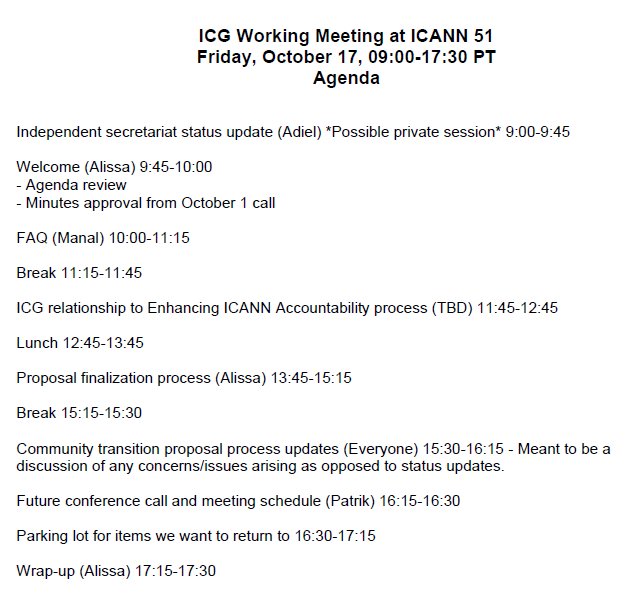 ICG Announces Sixth Conference Call: The IANA Stewardship Transition Coordination Group (ICG) will hold its sixth conference call on Wednesday, 29 October 2014 from 12:00-13:00 UTC, 8-9 am EDT (US), Time Zone Conversions. The community may attend by way of a listen-only mode Virtual Meeting Room through which audio of the call will be streamed. Interpretation will be available through relevant Adigo Bridge dial-in numbers and Conference ID codes. Note: Livestreaming translations in Français will be unavailable for this call, however a translation of the transcript will be provided after the meeting. Participants who are interested in an English line but are unable to join by way of the Virtual Meeting Room may request a dial-out service. 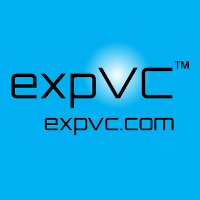 For all dial-out service requests please contact Alice Jansen by 11:00 UTC, 29 October. For more information about the ICG and the IANA Stewardship Transition: NTIA IANA Functions Stewardship Transition Microsite. How important is it that Doreen Bogdan is: a) an American; b) a woman; c) has worked in the U.S. government earlier in her career? Inestimable. For example, the top elected positions in the ITU do not include anyone from the Western Hemisphere: PP14: Elections for top 5 posts at ITU | Lingua Synaptica: "I [Samantha Dickinson] have also been told (but have not independently confirmed) that nobody from the Americas—that’s north, south and central America—has been in one of the top [elected] ITU leadership positions for the last 16 years. I had understood that the tradition in the UN system was to rotate the leadership positions amongst the various geographic regions, but this does not seem to be the case in ITU." Smartphones: So Many Apps, So Much Time: "... the proliferation of mobile devices has transformed us into an app-driven society, presenting marketers with new opportunities to connect with consumers by creating more interesting and sophisticated apps to command their attention. New data from Nielsen shows that U.S. Android and iPhone users age 18 and over spend 65 percent more time each month using apps than they did just two years ago... while there may be an upper limit to the total number of apps users are willing to access within a given month, the amount of time they are spending on those apps is showing no signs of slowing down." According to a new report from Sandvine, YouTube and Facebook account for roughly one third of mobile traffic in North America during peak periods (see chart below). HTTP, the protocol used for simple web browsing, is ranked third, accounting for 12.6% of mobile traffic. See: Are Domain Names Dinosaurs? BoomBustRT's Erin Ade interviews Melissa Bell, executive editor at Vox, to discuss how the Internet has changed the media business and what we might see in the future. Vox.com's Melissa Bell: 'This is a chance to do journalism differently' | Media | The Guardian: The co-founder of news website Vox.com on how it provides the information to help readers stay in touch with news cycle --"It's not often that a journalist will admit to falling off the news cycle. And yet for Melissa Bell, co-founder with Ezra Klein of explanatory news site Vox.com, that experience lies at the heart of her progressive views on journalism and at the core of what Vox is trying to do. "We [the media industry] present the news in a way that puts forward the newest information, not the most important information," she says... She's talking about Vox's slogan – Understand the News – but also about the motivation for the site, which launched on 6 April under the auspices of Vox Media..."
Milton Mueller discusses his representation of the GNSO on the IANA Stewardship Transition Coordination Group (ICG) during the group’s second meeting in Istanbul, 6 September 2014. Read also: Cauldron part 2: Is the names IANA compatible with the others? | IGP Blog: ".... the twin assumptions that 1) the IANA functions operator must be a single entity combining names, protocols and numbers, and 2) that the single entity should be inside a corporation [ICANN] that is responsible for policy making for domain names not only has practical problems – it poses major risks to the future autonomy of the internet. Although it has helped to uncover these dilemmas, the ICG process of allowing each community to develop its own IANA transition proposal actually minimizes these dilemmas. If all of these communities were thrown into the same cauldron to work out their desired transition plan, the temperature would surely rise even higher and the conflicts would be even more intense." Officials of the National Aeronautics and Space Administration and the Department of Defense. The ITU Plenipotentiary Conference is a three week, high-level policy conference held every four years with the goal of setting the ITU general policies, adopting four-year strategic and financial plans, and electing the ITU senior management team, members of Council, and members of the Radio Regulations Board. Tweets about "#PP14 OR #ITU OR #ITUPlenipot OR #Plenipot14"
#Plenipot14 media briefing from ITU: The ITU media/analyst briefing ahead of the ITU Plenipotentiary Conference 2014, in Busan, Republic of Korea, 20 October - 7 November, 2014. ITU Plenipotentiary Conference 2014 | Internet Society: Why is the Plenipotentiary Conference Important? The Internet Society's Submission on the 2014 ITU Plenipotentairy Conference. How Does the ITU Plenipotentiary Conference Work? IANA Stewardship Transition Coordination Group (ICG): The ICG will be holding a face-to-face meeting on Friday, 17 October 2014 from 09:00-17:30 PST/ 16:00-00:30 UTC in Los Angeles, California (Time zone conversions here). Overview: This is a working session of the IANA Stewardship Transition Coordination Group (ICG). Another #ICANN Board member has resigned. What is going on? Oh great, we've got to the bit where the Board complains it's not allowed to have ideas or share them. Poor Board. Nobody listens. 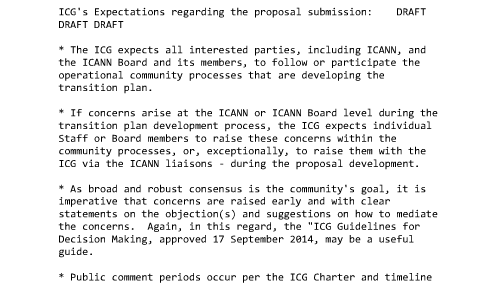 Dear #icann board, you are not 'like everyone else'. You are in a uniquely privileged and powerful position. Power relations exist. Own it. Great work on #ianasteward by US stakeholders to make sure no substantive issue gets discussed and the process derails. Predictable. This infomercial did NOT say 'The #gnso review is a whitewash, a missed opportunity and a purposely Board-directed effort to ignore probs'. @mathieuweill Given it’s only Monday, that doesn’t bode well for the rest of the week. #ICANN51 L Strickling: I thought it was already clear, but to restate it again, #IANAsteward & #ICANN accountability streams are related. #ICANN51 GAC, China: ICG defined 3 functions for #IANAsteward transition prop: protocol parameters, names & numbers. What about root zone? #ICANN51 GAC, Brazil: if we limit #IANAsteward to compliance w NTIA conditions, we miss opportunity to address global ICANN accountability. List of govts wishing to speak at #ICANN51 GAC discussion on #IANAsteward is getting longer & longer. 2.5 hr session won’t be long enough. #ICANN51 GAC, France: supports Brazil & Portuga - not possible to consider #IANAsteward w/o also including #ICANN accountability in package. #ICANN51 GAC, France: GAC development of #IANAsteward principles is good idea, but also needs to include accountability reform too.